The Grampians Region is one of the major attractions in the state of Victoria. With many natural attractions across the gorgeous landscape, the area offers plenty of things to do to for visitors to the north-west of Victoria. Often regarded as the haven of western Victoria, the Grampians is truly a beautiful mountain range suitable for family vacations, adventurous getaways and honeymoons. The number of scenic attractions and activities in the Grampians are close to endless. You will find an array of adventurous activities as well as family friendly activities suitable for visitors of all ages. Whether it is wildlife watching, a scenic driving tour or a bushwalk, there are so many activities to keep you busy during your Grampians stay. Enjoy exploring the region’s stunning landscapes you will certainly come across some of Australia’s most impressive wildlife; including koalas, kangaroos, echidnas and emus. In addition, you will find a wide array of nature walks perfect for day or night. 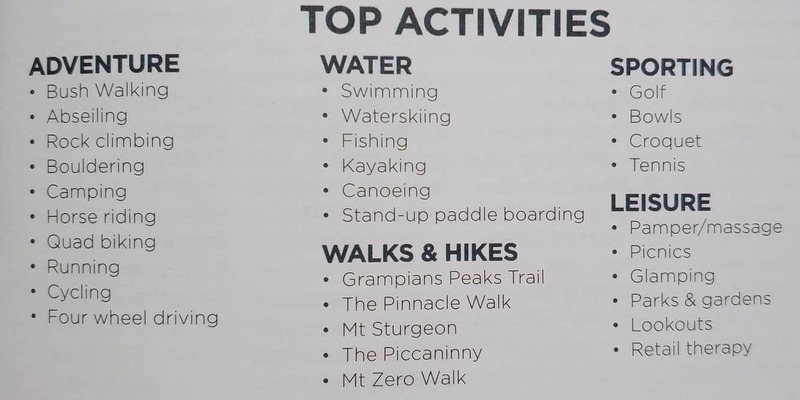 Some other popular activities including hiking, rock climbing, fishing and swimming. Many visitors to the Grampians also come camping or caravanning for a cheap weekend away. Make sure you check out the spectacular Grampaians National Park and head up to the popular Boroka Lookout and the Pinnacle to enjoy the excellent views of the region and its all scenic points. You can also go horse riding through the beautiful Grampians Region and stop for a picnic along the way.